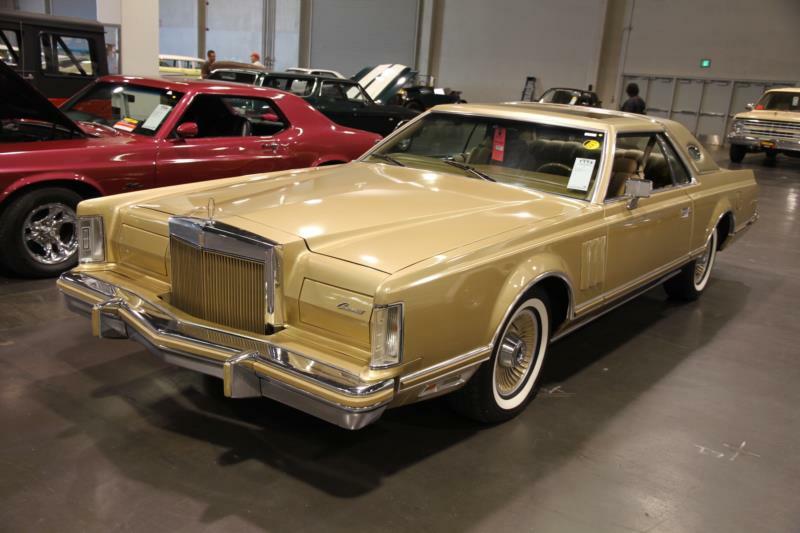 Following on the great strengths of the Continental Mk III and Mk IV, Lincoln introduced the 1977 Continental Mk V as an evolution of its predecessors. The new car had a more squared-off appearance, but several styling characteristics carried over: concealed headlights, turn signals incorporated into the leading edge of the front fenders, an upright chrome grille, the trademark hump across the edge of the trunklid, and the oval "opera windows" in the C-pillars. Seventeen exterior colors were offered, with vinyl roofs available in full or Landau styles, in one of 12 colors. The big cars offered a supple ride, both from the suspension as well as the luxurious interiors. Velour was the standard—available in seven different colors—while leather and vinyl could be specified in one of 14 colors. Standard features inside included Twin Comfort lounge seats, a Cartier clock, and a four-speaker AM/FM clock, and power came from a 400-cid V-8 making 179 horsepower, or an optional 460-cid V-8 making 208 horsepower. Both engines were mated to a 3-speed automatic transmission. A Luxury Group option outfitted the interior with two-tone leather and vinyl, while the Majestic Luxury Group turned the Mk V's interior into a sea of crushed velour. Lincoln also offered several special models in the Mk V, dubbed Designer Editions. These Designer Edition Marks included Cartier, Bill Blass, Givenchy, and Pucci, and each featured special plaques to authenticate them, unique colors and trim packages, and designer signatures in the opera windows. The Mk V carried over largely unchanged for 1978, and the big news was the Diamond Jubilee Edition, built to commemorate Ford's 75th anniversary. The cars came in either Diamond Blue or Jubilee Gold and were outfitted differently and more luxuriously than any other Mk V, with ebony inserts, color-matched cloth seating with broadlace inserts, Tiffany-cut pile carpeting, beveled instrument panel lenses, optional an owner monogram, and much more. Most optional features on other Mk Vs were standard on the Diamond Jubilee, and the distinction added about $8,000 to the Mk V's $12,000 price tag. Once again, the Mk V saw few changes for 1979—its last year of production before Lincoln downsized its flagship to meet stricter emissions standards. New options included an AM/FM/8-track stereo, as well as an AM/FM/cassette stereo. A final special edition, the Collectors Series Mk V, was essentially a repackaged Diamond Jubilee from the previous year and came with exclusive colors and interior materials. The Mk V marked the apex of Lincoln luxury and engineering, as subsequent cars became victims of stricter federal requirements, badge engineering, and shifting buying habits.